William Branham said he was just a toddler when he heard a voice say You will live near a city called New Albany. Asking his mother about this, she was shocked, as New Albany was over 100 miles away from their residence in Burkesville, Kentucky. William Branham's father, who was on the run from the law in the State of Kentucky, sent the family a letter when William Branham was three years old calling them to Indiana, where they settled a few miles from New Albany. Like so many other of William Branham's prophecy, the only indication that this prophecy was made was from William Branham. William Branham only spoke of this prophecy once in Jeffersonville in 1958, and the remaining occasions were all across the country. Given his significant credibility problems, any after the fact prophecies must be discounted. All of his prophecies were also apparently in a book, which apparently has been lost. And then I remember one day the spring (this little cabin) was just behind the house. And--and during that time after... There's nine... eleven months difference between me and my next brother, and he was still crawling. And I had a big rock in my hand, and I was trying to show him how hard I could throw this rock in the old mud, where the spring had run out of the ground and made the muddy ground. And I heard a bird, and it was singing up in a tree. And I looked up to that tree and the bird flew away, and, when it did, a Voice spoke to me. Now, I know you think I could not think and remember that. But the Lord God Who's Judge, the earth and the heavens and all there is, knows that I'm telling the truth. That bird, when it flew away, a Voice came from where the bird was in the tree, like a wind caught in the bush, and It said, "You'll live near a city called New Albany." 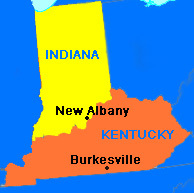 And I've lived, from the time I was three years old until this time, within three miles of New Albany, Indiana. I went in and told my mother about it. Well, she thought I was just dreaming or something. Later we moved to Indiana and Father went to work for a man, Mr. Wathen, a rich man. He owns the Wathen Distilleries. And he owned a great shares; he's a multimillionaire, and the Louisville Colonels, and--and baseball, and so forth. And then we lived near there. ↑ :Sermon: My Life Story, LA, California, April 19, 1959. This page was last edited on 22 August 2015, at 03:48.